#Syria #Hama The scientific research center in Masyaf was Targeted by #Israeli #Israel Jets Tonight. This Photo is from the Spot Hit. 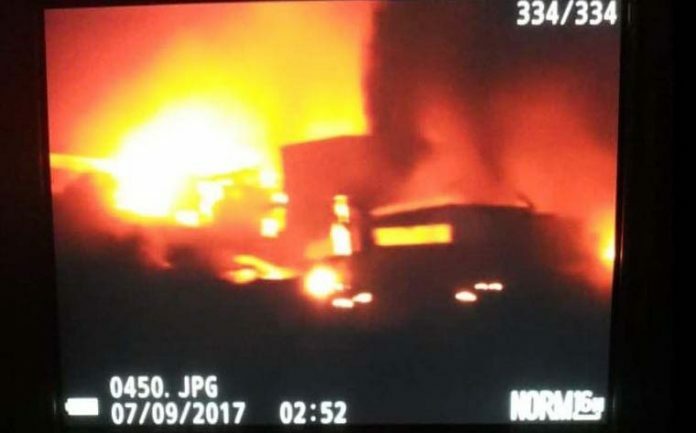 Israel attacked a chemical weapons development facility near the city of Al-Maysaf in the Hama province in western Syria overnight Thursday, according to multiple reports on Twitter. According to Israel’s Channel 2, the Syrian army claims 2 Syrian soldiers were killed in the attack, 3 more were wounded, and there is property damage. If true, this makes it the first attack since the cease-fire agreement that was reached between the sides in July, and following a meeting between Prime Minister Netanyahu and President Putin in late August. Official Israeli sources refused to comment on the reports, noting they do not comment on foreign reports. On Tuesday, the IDF launched its largest military exercise in 20 years in the north, simulating a war against Hezbollah. The exercises continue today. According to the IDF, Hezbollah was following closely the preparations for the maneuvers, in which the IDF Northern Corps is training with multiple divisions operating in simulated combat situations. The exercise simulates a scenario of rapid escalation in the security situation in the north, in which the IDF is required to protect the area from terrorist infiltration, after a naval Hezbollah force has penetrated the settlement of Shavei Zion, and another force crossed the Bnot Ya’akov Bridge to attack the nearby Kibbutz Gadot. Later the forces will practice an attack on Lebanese territory. The Air Force, the Navy and the Intelligence Branch also participate in the exercises, training for the possibility a Hezbollah invasion.